So my brother's wedding has gone and done. Chinese tea ceremony with my parents. I will try to reserve my comments about how my brother managed his wedding, as it was his auspicious day. I'm not getting married any time soon. But the costs of weddings is enough to drive anyone up the wall, at least for Malaysians. At least these are my thoughts this morning, post wedding. My family held a pre wedding dinner the night before the wedding. This allowed those who have not been invited to the wedding to still participate in the wedding festivities. Weddings are an expensive affair, for both the hosts, as well as guests. There is an expectation that guests have to contribute either monetarily, or by buying a gift in western tradition from a shopping list that the couple provides when they send out the wedding invite. The red packet giving yesterday from both reception guests and the tea ceremony (from relatives) was enough to break even and pay off the reception dinner bills. It was up to RM50k ish and the cost was roughly the same. Let's just say there were at least up to twenty tables in the Concorde Hotel KL last night, at one table costing at least RM1,200. This menu costs RM1,200 per table of ten. Mango terrine with strawberry compote and crispy sesame cracker. You get what you pay for, so the food was fairly chic, and the final dessert of the day was well made, whoever the patissier was. My brother and his wife have been rather thrifty in their spending for the wedding preparations. 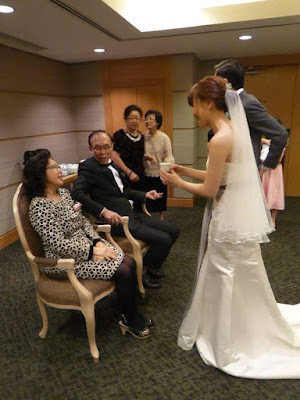 The bride was just wearing the same two piece wedding dress, which she changed for dinner by putting on a top. According to my dad, they may have bought the dress in Bangkok. They also didn't do a wedding photo album which a lot of couples seem to like doing these days. That would also add up few thousand bucks to the costs. They did away with many traditional Chinese routines including the games for the males, and had both church service and tea ceremony at the hotel. I asked my dad, how is any normal man able to provide a dowry for the wife at today's increasing inflation and the meagre salary that he earns? Even if both are working, wedding costs is enough to make any couple go crazy. 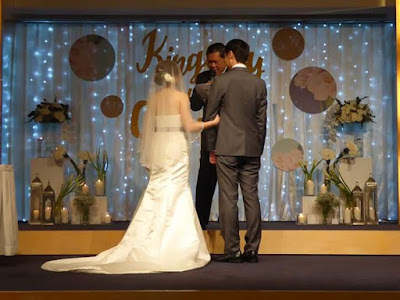 The only comments my father has to say is regardless should I ever hold a wedding ceremony and reception in Sydney or both in KL, is to serve the Lord faithfully, and the Lord will provide more than is needful to cover the costs of the wedding. Of course, you both need to work out the expenses thoroughly, and leave the rest of it to God's providence.